How Would You Spend Unexpected Income? Do you want to change your spending habits? To get onto the path of conscientious spending, it’s helpful to step back and explore your current relationship with money: Why do you make the spending decisions that you do? How does spending money make you feel? Developing a better understanding of how your mind works when it comes to the subject of money can help you overcome challenges that you may face in saving and spending wisely. Behavioral finance is a relatively new field of science that explores how people make decisions about money. One of the key principles is the concept of mental accounting, which is a game your mind plays on you. Use the Mental Accounting Quiz provided here to think through each scenario outlined and note how you anticipate you would feel about each situation if it were to happen to you. 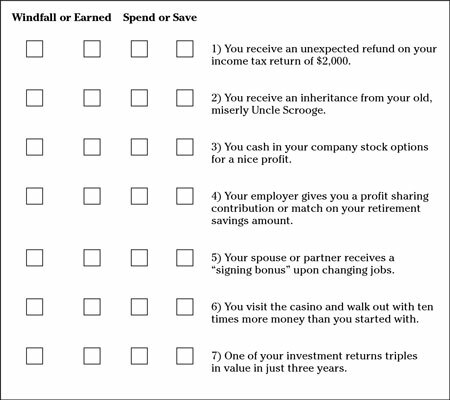 If you feel that the money was a windfall, or in essence “found” money, check that box. Or if you feel that the money was “earned,” something you deserved (similar to wages), check that box. Then indicate whether you would be more inclined to spend the money or save it based on how it came to you. Click here to download and print the Mental Accounting Quiz. Reflect for a moment on your responses. Did you find yourself feeling more free or entitled to spend a windfall versus items that you considered earned? Because each of these scenarios illustrated a situation that may have been entirely unexpected, did you feel less guilty about spending the money? Did guilt even cross your mind? Did you view this newfound money as an opportunity to spend or save, or possibly both, depending on your own mental accounting? Think for a moment about these questions and then write your responses down. Do you feel more entitled to, or less guilty, spending money that comes to you as a windfall, compared to money that you earn? A dollar is a dollar. It shouldn’t make a difference how the money came to you. Your mind plays tricks on you — in behavioral finance, they call it mental accounting. You spend money less carefully when you feel you have received a windfall than if you earn it. Focus on the fact that you have more money with which to accomplish the goals most important in your life. Don’t waste a windfall. Use those dollars just as thoughtfully and appropriately as you would dollars that came in your paycheck. Another fundamental principal of behavioral finance illustrates that people are naturally loss averse. In other words, they feel more pain from losing money than they feel pleasure in gaining the same amount of money. This aversion to losses helps explain why some people continue to hold on to a bad investment, because after they sell it, the loss becomes real to them. You may also see other symptoms of loss aversion in overly conservative investment portfolios. Being averse to loss is a very normal and healthy human emotion. However, the most successful money managers are able to minimize their emotional urges and make rational decisions with regard to their money.